The Castell Trapped Key Interlocks K-FSB-0-1 Castell Locks ( KFSB01 ) are used as a part of a safety system to allow safe control of valves or disconnect switches. While power supply to the system is switched on, the access doors to the hazardous area are locked closed. Key A is trapped in the disconnector K bolt interlock (1) while the process is on. To enter the hazardous area, the disconnector is turned to the off position and key A is released, locking the disconnector in the disengaged position. Key A is then taken to the grounding switch. Key A enters the second K lock (2) which retracts the bolt enabling the cammed switch lever to be rotated to engage the ground. Once rotated, the recess in the cam aligns with the next K lock (3) with key B trapped in its lock. Key B can now be removed from K lock (3), which now locks the lever in place ensuring that the ground connection cannot be broken. 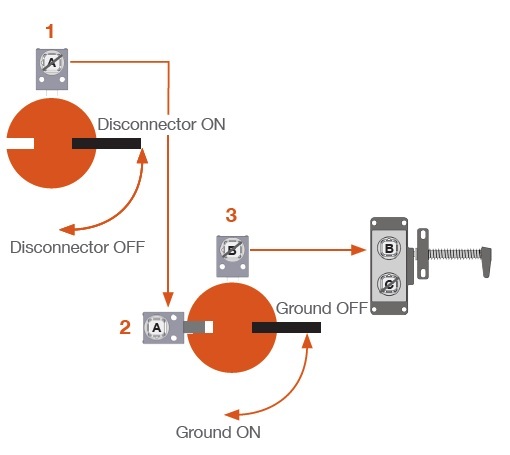 The system is now disconnected and grounded, key B can be taken to operate the access interlock on the door of the hazardous area to gain access into it. Application K-FSB-6.4-4 ( K-FSB644 ) Castell Lock : The Castell Trapped Key.. Application:Castell Lock K-FSB-6.4-1 ( KFSB641 ) is a Trapped Key Interlocks K by Castell Safety Int.. Application:Castell Locks K-FSB-12.7-1 ( KFSB1271 ) is a Castell Trapped Key Interloc.. Application:Castell Locks K-FSB-19.1-1 ( KFSB1911 ) is Castell Trapped Key Interlock.. Application:The Castell locks K-FSB-25.4.1 ( KFSB2541 ) is a Castell Trapped Key Interlocks K by Cas..